Stage costume can be used to make points about a character's status and personality. Sometimes the message is obvious. Loud clashing colours will be a good indication of brashness and lack of taste, while dark, opulent fabrics can signal wealth and dignity. Designer Fotini Dimou produces a subtler effect with her costume for Anton Chekhov's Irina Arkadina. Arkadina, one of Russia's leading actresses, is making her annual visit to the family's country estates, mainly, it seems, so that she can complain about the boredom of country living and contrast it with the sophistication of her life in Moscow. Her evening gown for Act IV is an elegant creation in embossed black velvet and gold lace embellished with artificial gemstones and sequins, its lavishness emphasised by the placing of a richly decorated panel at the back as well as the front. The dress was worn in John Caird's production of The Seagull in the National Theatre's largest auditorium, the Olivier Theatre, and although the costume's finer details would not be visible to members of the audience sitting in the rear stalls and the circle, they contribute to the overall effect. Arkadina is a vain woman who must always make herself the centre of attention and this is a dress to attract the eye. Taken out of context it seems appropriate evening wear for a grande dame of the theatre. On stage, however, it reveals much about Arkadina's character. She is overdressed for an evening at home, playing cards with her brother and neighbours. In these surroundings the dress becomes vulgar, an unnecessary assertion of self-importance, and ironically illustrates a comment made by Arkadina's son, Konstantin, in the first act. Konstantin complains that his mother has 'seventy thousand' in the bank but is always pleading poverty if any of the family need financial help. Arkadina's outfit makes it obvious that she has plenty of money to spend on herself. Judi Dench's performance drew attention to the character's vanity, selfishness and love of status. The The Times critic noted that in this costume she became 'an Elizabeth I clone'. 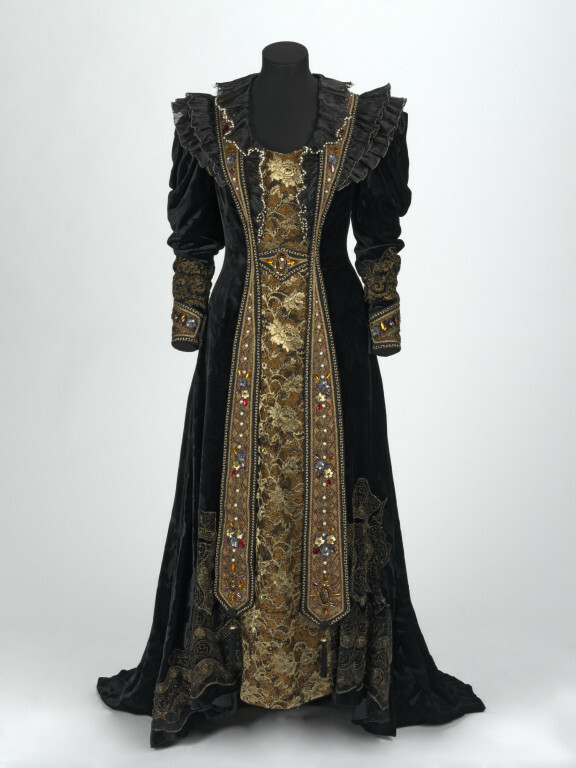 Edwardian-style evening gown of heavy black panne velvet, the front and back with full-length inserted panels of metal thread gold lace with at waist to front a large oval artificial gem within gold braid. At each side of the front panel two narrower hanging panels studded with artificial gemstones, artificial pearls and sequins, each ending in a point with a tassel of plaited braid. The 'leg of mutton' sleeves with deep cuffs decorated with the same metal thread lace and 'gems'. The wide collar of three layers of pleated gauze, the inner layer wired and edged with artificial pearls. 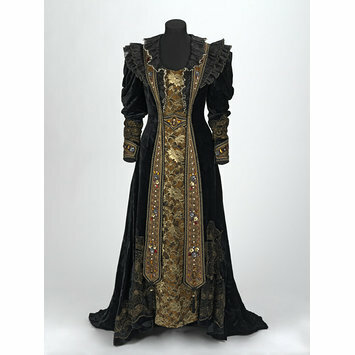 This costume was worn by Judi Dench as Irina Arkadina (Irina Nikolayevna Trepleva) in Anton Chekhov's play, The Seagull, National Theatre, 1994. The production played in the National's Olivier Theatre. It was directed by John Caird, with costumes designed by Fotini Dimou and settings by John Gunter. Arkadina in the play is a renowned actress and attention seeker. In Judi Dench’s first entrance in this dress she was able to convey the extent of Arkadina’s egotism. The dress is completely unsuitable for a quiet card game at her brother’s house in the country, but it gives Arkadina an opportunity to flaunt her wealth and success.